In 2013, Singapore's first LNG terminal began operations. Prior to 2013, Singapore's only option was to import natural gas through pipelines from Malaysia and Indonesia. To support the development of Singapore as an LNG hub, Singapore had to create an 'artificial' demand for LNG to wean off dependence on pipeline gas. To achieve this, EMA ( Energy Market Authority) required power generation companies to use LNG instead and at the same time imposed restrictions on pipeline gas usage. This is despite LNG gas being much more expensive than pipeline gas. Read the article by Hogan Lovells Lee & Lee in 2017, page 3. As part of the "encouragement" to use LNG gas to support the Singapore's LNG hub ambitions, LNG Vesting Contracts were given out by EMA to newer power generation companies who uses LNG gas . What these vesting contracts effectively did was to provide revenue stabilisation as power generation companies now know they are able to sell a specified quantity of their electricity at a fixed price. This allowed visibility and so many power generators entered the market, resulting in the current excess glut of electricity. EMA has stated that the Vesting contracts was meant as a control of market power but personally, i think it isn't. New power generation companies have a small market share and so they wouldn't be able to exert any market power at all. Yet, they are given LNG Vesting contracts, so it's very hard for me to believe that was the noble intention. Anyway, who cares about what a layman blogger thinks. Let's look at what our industry experts think about Vesting Contracts. Tuaspring is a power plant that uses only LNG gas as fuel to generate electricity. Chairwoman and CEO Olivia Lum stated in the townhall two factors (among others) that caused Tuaspring failure. The expensive "take or pay" contract for LNG gas and the weak electricity market resulting in the low USEP ( market price of electricity). She mentioned that based on the "take or pay"contract it is still cheaper to take the gas and burn it, even if it is not needed due to penalties. Is this contract onerous due to the need to support the LNG terminal, a national ambition? Was Tuaspring restricted from using the cheaper pipeline gas from Indonesia or Malaysia? Without the restrictions by EMA on using the cheaper pipeline gas, would Tuaspring have survived? Is Tuaspring failure on a purely commercial basis? Regarding the weak electricity market, i think it is really likely the LNG Vesting contracts dished out by EMA caused the weak market. The whole industry was facing losses. ".......If the whole industry is losing more than a billion dollars every year, it makes the whole industry very vulnerable. I feel that it's not sustainable..... "
The policy in Singapore is for the minimum reserve margin to be 30% above System Peak Demand. In 2017 and 2018, the reserve margin is at or above 80% . Isn't that too much or being too kiasu? 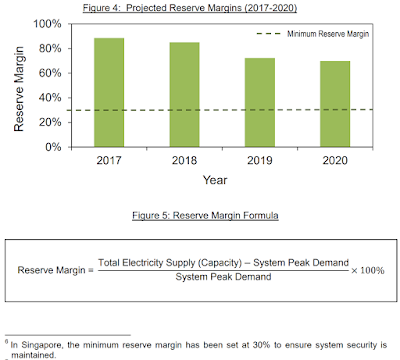 Even from 2019 onwards, the reserve margin is above 60%, still too much compared to 30%. And yet, despite this kiasuism or mis-planning , blackouts in Singapore still occured in June 2018 and September 2018. What an irony! 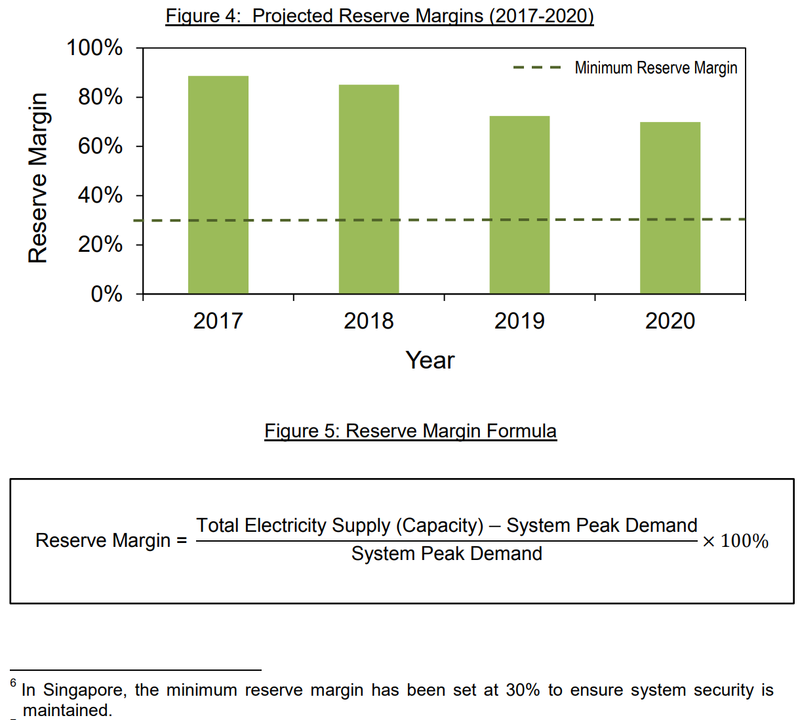 I can't see a reason how the Energy Market Authority of Singapore could be so blind as to be able to dish out licenses so freely to power companies such as to exceed the 30% reserve margin policy by such a wide margin. Population growth and industrial growth is controlled and can't increase suddenly overnight, while total capacity of power plants can be predicted as it is an addition of number of power plants. 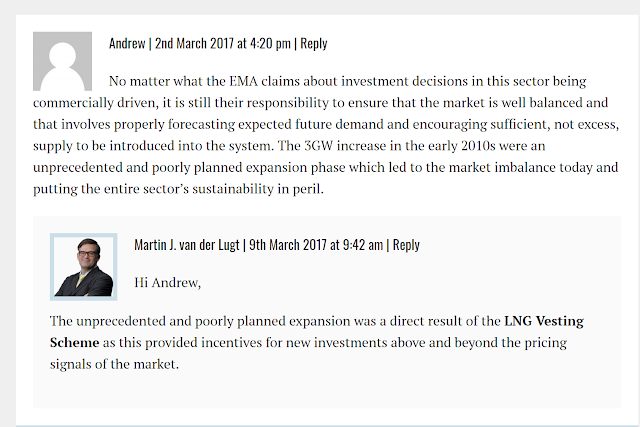 Did the LNG Vesting Scheme dished out by the EMA and the excessive dishing out of licenses result in the oversupplied electricity market in Singapore, resulting in the failure of Tuaspring? As seen from above, the benefit of the LNG Vesting scheme could have balanced out the expensive "take or pay" contracts for the use of LNG gas from the LNG terminal. 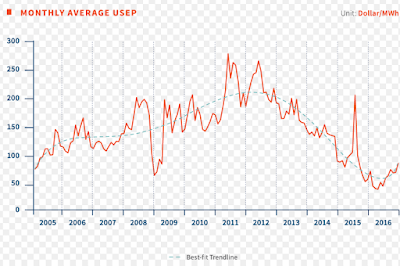 To further highlight why the LNG Vesting scheme was sort of a lifeline to a power generation company, look at the volatile USEP ( market price of electricity) chart below. As stated above, the power generation companies did think that the Vesting contracts had a revenue stabilisation factor, and so one will not be exposed fully to such volatility. 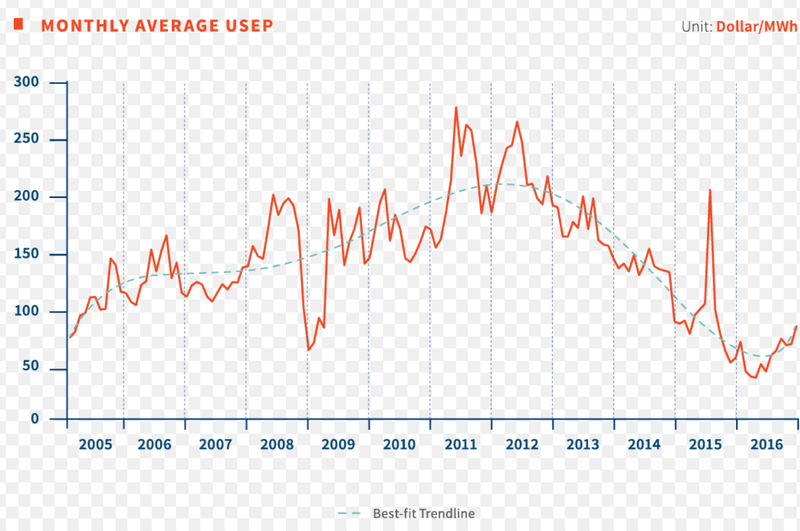 The USEP price reached the lowest in 2016 due to the overbuilding of power generation companies due to the aforementioned LNG Vesting Scheme. 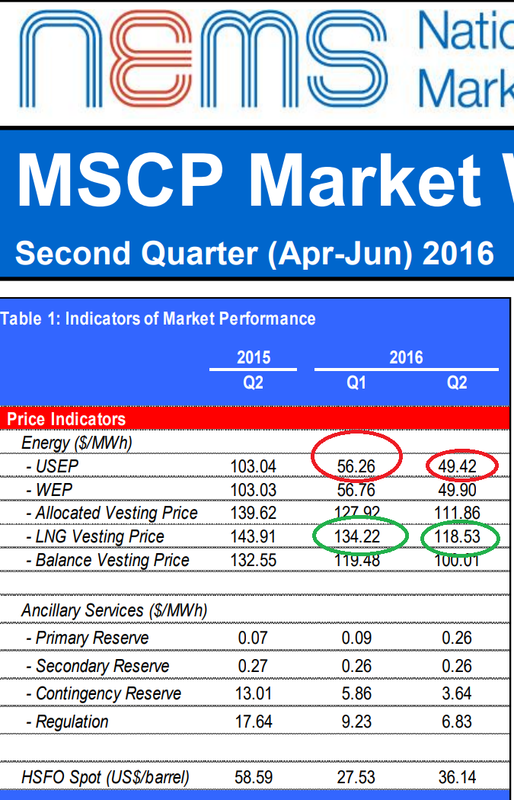 From the diagram below, it can be seen that the USEP price in Q12016 was $56.26/MWH. Compare this to the higher price of $$134.22/MWH enjoyed by the new power plants under the LNG Vesting Scheme. The power generation companies are paid an excess of $77.96/MWH! This explains very clearly why the power generation companies think the LNG Vesting scheme is a kind of "incentive". But why did Tuaspring bleed so much in 2016 if there was such an "incentive"? Apparently, Tuaspring did not participate in the LNG Vesting Scheme and so was wholly subjected to the volatility of the USEP electricity prices. This is utterly ridiculous to think that the Tuaspring project went ahead without any "incentive" (LNG Vesting Scheme) which was to serve somewhat as a cushion for the expensive "take or pay" contract to support the Singapore's ambition to be a LNG hub. What gave the Board of Directors of Hyflux such mighty balls to enter into the electricity market, with no prior experience i must add, since they are essentially a water company before that? This especially without the cushion of a LNG Vesting contract. Olivia Lum did say they were given a projection of 8 million population projection by " don't know who". As of now, no clarification from Hyflux on who gave such a lofty projection though an email had been sent for clarification. Does the excessive 80% electricity reserve margin lend any credibility to Olivia's claim of a 8 million population projection? But the population white paper publicly available only stated 6.9 million. 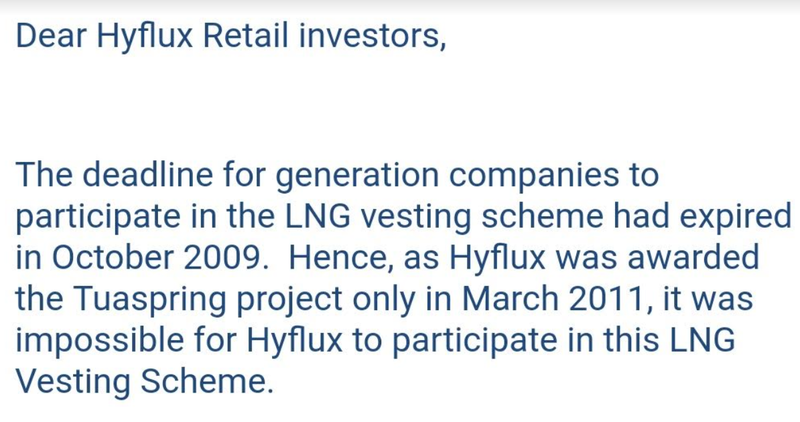 Did Hyflux appeal to the EMA to let them enter the LNG Vesting Scheme? Was Hyflux rejected by EMA? I don't think the failure of Hyflux is due purely to commercial decisions as can be seen above. Poor policy planning also played a part in its failure. This does not mean i'm thinking of absolving Hyflux Board of Directors of any responsibility, because they are definitely responsible. But i do not think that the regulators, both EMA and PUB should be silent on this issue. It is also very ridiculous that the biggest three power generation companies ( YTL Power Seraya, Huaneng and Tuaspower) in 2014 issued a warning call to EMA that the market was unsustainable. The words used were" ...long term damage..." and " ...unsustainable/market failure..". I wondered whether EMA heeded any of these warnings from the industry. I do feel a tinge of betrayal where the $500 million perpetual securities were still issued in 2016 to unsophisticated retail investors when such problems have already been brewing and EMA can't presume to not know about this, especially since they already received the feedback in 2014. Or maybe, just maybe...They don't care...maybe EMA is secretly happy that these retail investors were going to do " national service" by writing off their investments to support the LNG hub initiative of some Minister or Ministers. Do they realize that many among the ranks of these investors are retirees or people who work their hearts out for many years to save that kind of money ? Where is the "heartware" left in this country? They just don't care! Regarding the up to 30% cheaper electricity rates that one currently enjoys now due to the Open Electricity Market that seem to be a good initiative. Don't rejoice as yet. Consider this, who was paying for the " incentives" to those new power generation companies ? The excess of $77.96 /MWH in Q12016 or the excess of $69.11/MWH in Q2016, who paid? Read this article titled " Vesting Contracts made Singapore Consumers pay 2.7 Billion SGD over last 4 years". If this article is correct, wouldn't it mean we have all just prepaid for our electricity in the previous years and actually, we should not be thinking we are enjoying any cheaper rates now? Who are the sacrificial lambs in this episode? 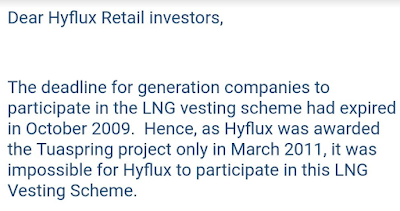 The total 50,000 retail investors of hyflux securities, who have partly done their "additional" national service to the country to help develop its ambitious LNG hub. 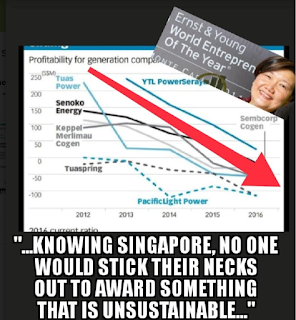 And guess who enjoyed this "incentive" of the LNG Vesting Scheme, presumably paid by Singapore citizens tax money? 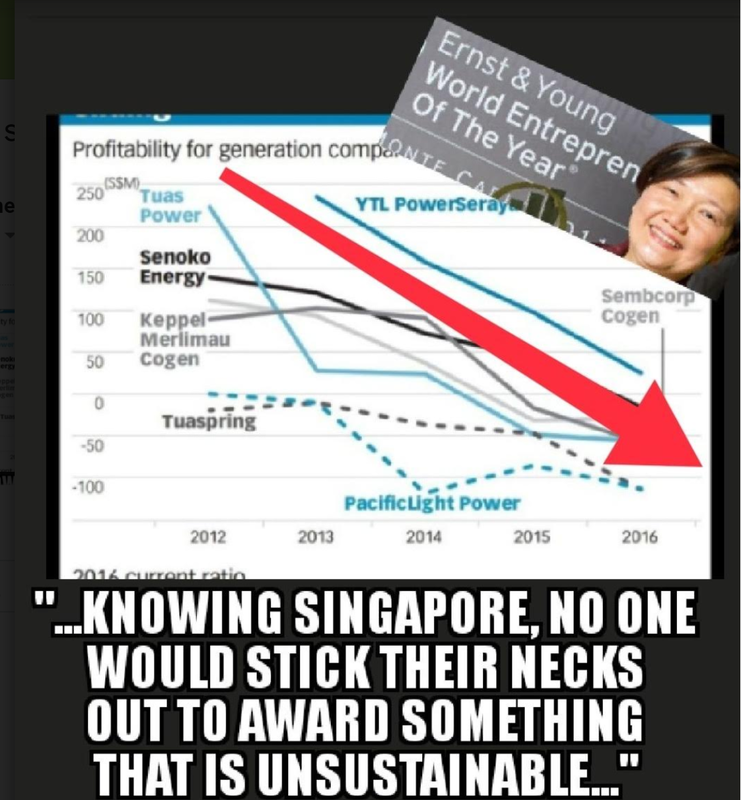 Not Tuaspring for sure since they couldn't sign up for the LNG Vesting Scheme. See below picture. 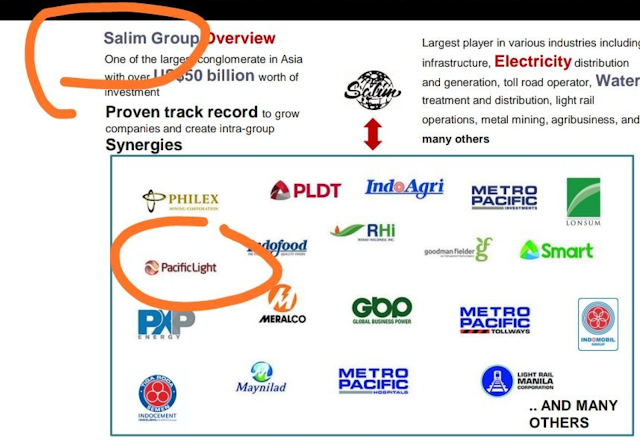 Tuaspring, predominantly, owned by Singapore investors did not get to enjoy any of these incentives and failed, while Pacific light owned by the Indonesian Salim Group enjoyed it! It is really ironic or in bad taste if Salim group is again going to win, at the expense of Singaporeans. REJECT ANY UNFAIR SALIM PROPOSAL AT ALL COST! I am too cheesed off to write further today!